After designing the frame geometry we Guru, we selected the Guru Photon HL for the frame we would build for them. While the Photon HL is their premier frame, Guru can manipulate the carbon lay up to offer the rider a very smooth ride while retaining good power transfer and stability under extreme conditions, the challenge of any bike frame. We chose the new 11spd Shimano Di2 Dura Ace shifting groups, the battery installed inside the Zipp carbon seat post. We also used the matching Zipp carbon SL Speed stem and carbon Contour bars for their short and shallow reach. We used the Zipp parts cause of their function for the fit and for how they compliment the paint finish we selected for the frames. We used Praxis BB30-24 bottom brackets with upgraded Ceramic Speed bearings for that frictionless spin of the Rotor 3D cranks which have Praxis chain rings bolted on with red anodized KCNC chain ring bolts. 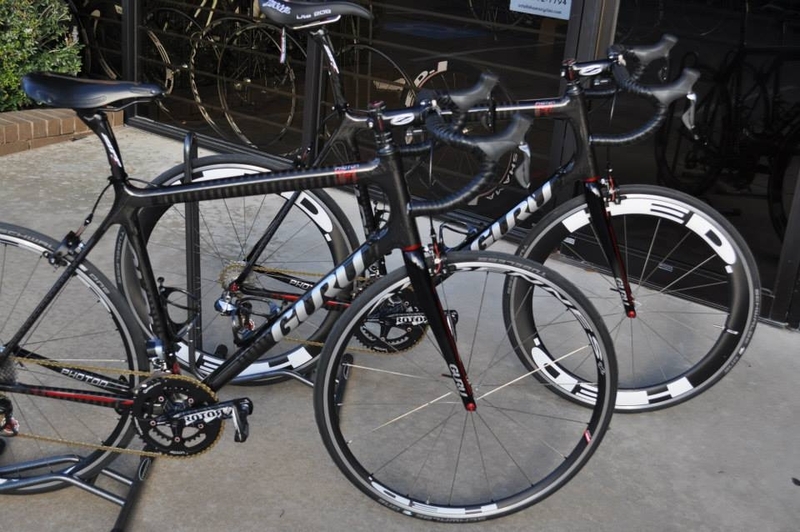 We used TRP 970SL EQ brakes to slow these machines down. Their light weight and finish made them a great choice for the build. HED Ardennes + wheels were selected for her and Jet 6 + wheels for him. We wrapped them with the new Schwalbe ONE Tubeless tires. Other little pieces were Tiso ceramic pulley wheels in the rear derailleur, Power Cordz brake cables, Far Near skewers, Dura Ace pedals, Arundle Mandible carbon cages, and Lizard Skins bar tape. On his bike we also put Zipp Vuka Clip on aero bars with Di2 aero shifters. This allows him to get into an aero position and still be able to shift while maintaining full function of the brake lever shifters on the handle bars. How do they ride? Well after their first rides I believe this couple is happier than ever and ready for another 25 years of enjoying the ride. Watch this space for news, tips, and promotions!